Click here to listen to Janeane Bernstein's conversation with author Mitch Prinstein! No matter how old you are, there’s a good chance that the word “popular” immediately transports you back to your teenage years. Most of us can easily recall the adolescent social cliques and the high school pecking order, and even as adults we all still remember exactly where we stood and the powerful emotions associated with our status persist decades later. In his new book, Popular, UNC professor of psychology and neuroscience examines why popularity plays such a key role in our development and, ultimately, how it still influences our happiness and success today. 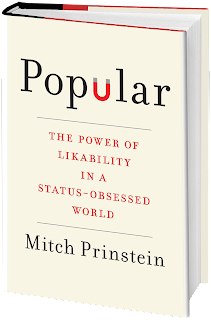 But it’s not always the conventionally popular people who fare the best, for the simple reason that there is more than one type of popularity—and many of us still long for the wrong one. As children, we strive to be likable, which can offer real benefits not only on the playground but throughout our lives. In adolescence, though, a new form of popularity emerges, and we suddenly begin to care about status, power, influence, and notoriety—it is this type of popularity that hurts us more than we realize. Realistically, we can’t ignore our natural human social impulses to be included and well-regarded by others, but we can learn how to manage those impulses in beneficial and gratifying ways. Prinstein shows us how to make the wisest choices for ourselves and for our children, so we may all pursue more meaningful, satisfying, and rewarding relationships. Mitch Prinstein*, Ph.D. is a husband, a father, board certified in clinical child and adolescent psychology, and serves as the John Van Seters Distinguished Professor of Psychology and Neuroscience, and the Director of Clinical Psychology at the University of North Carolina at Chapel Hill. Prinstein’s Peer Relations Lab has been conducting research on popularity and peer relations for almost 20 years, and has been funded by the National Institute of Mental Health, the National Institute of Child and Human Development, and several private foundations, resulting in over 100 scientific works, including a slew of scientific journal articles, book chapters, a set of encyclopedias on adolescent development, and even a textbook on the field of clinical psychology. * He was not popular in high school.